For decades, and even centuries, the dominant ideology in the minds of western civilization has been established by people in power positions using social pressure and dissuasion, principally using mass media in whichever form it existed at the respective time. Particularly in "Latin America" [ please do notice this is a wrong way to describe it and that's why I use the quotes ] this has been so since the first half of the first millennium of the Gregorian Calendar when one of the first big Mesoamerican civilizations was at its peak, the Teotihuacán civilization in Mexico; I must say that when I watched a documentary about it on National Geographic Channel I was very impressed by how the state/government of that culture controlled the people by even making them paint political murals inside their houses! Making that government possibly the first 1984 [ a book written by George Orwell in 1948 that later became a great movie by Michael Radford ] in the history of America [ When I say America I am not referring the United States of America, when I refer to the United States of America I will say "the United States of America" because that is its name ]. It might be true that the inspiration of 1984 was the "totalitarianism" and "democratic socialism" [ obviously capitalist terms ] going around in the Soviet Union with Stalin, but it is also true that some of those ideas that the government, described by the author in the book, used to shape feeble minds [ being the most important one to control mass media ] were used and are being used by capitalism in order to get their ideals inside people's minds. In this sense, the leader[s?] of this socio-political-economical movement have gotten control of a huge amount of mass media throughout America, newspapers, TV news, even the Internet of course, just so that they can manipulate and influence people's opinion as well as distract them from serious stuff with phony and/or irrelevant news/events. Having said all this, if you live in America or have some interest in American politics, you might have guessed already where this post is heading towards: RCTV. Those simple four letters that have been around my head [ and not because I want them to ] for weeks now. If you don't know what I'm talking about then let me guide you into this: I don't know how long ago the president of Venezuela, Hugo Chávez, announced that "the state" wouldn't renew the broadcasting license for a TV station called Radio Caracas Televisión and would stop their transmission on May 27th [ and so he did ] because their news/programs/etc were anti-constitutional, put in other terms, they are capitalists and he is a socialist so they were airing stuff he didn't want Venezuelans to watch. All the supporters of that channel around the world started criticizing Chávez and calling him a dictator and such, saying he was acting against free speech and every other attack to "freedom" you can think of. In my country, El Slave-ador, they have been talking over and over and over and over about this, ASDER [ Salvadorian Association of Radio Broadcasters ] and AIR [ Inter-american Association of Radio Broadcasters ] have been showing advertising all over the place [ radio, TV, newspapers, fliers ] and being so annoying about it, repeating again and again why we should never vote for the national socialist party or we could lose our "freedom of speech" [ right ] just as it is happening in Venezuela. Well today I had it, this was all I can take, all these people are doing is because they no longer can keep getting their capitalist ideas inside Venezuelans' minds. They don't care about freedom of speech, they don't care about the people working on that station losing their jobs, they don't care about Venezuelans, they don't even care about their own mothers, all they care about is their money and how a socialist Venezuela endangers their stupid [ spikette2108's adjective ] way of life, all they care about is that they lost against Chávez, all they care about is they won't influence and distract Venezuelans anymore, so stop bitching around with lies! if you're gonna put some advertising then let them say the real reason for them but don't try to sugar-coat it with "freedom of speech" stuff because you have been stealing it for decades! you control almost all the mass media and only show the news that are not threatening to your ideals! how is that freedom of speech?. After stating all this stuff against capitalism and particularly capitalists, the logical conclusion is that I am now about to support Chávez and congratulate him on blocking the channel, well of course that I won't!. It all appeared to me so clearly while he was giving a speech at a university in Venezuela, he talked about hegemony and how there was a "political scientist" [ I don't remember the name ] who said that it was obtained throughout many generations and years and how a crisis of power takes place when there's a rising hegemony that hasn't been completely established and there's a falling hegemony that hasn't completely fell; then I thought, who needs hegemony when you are doing things right? who needs to control people's thoughts, dreams, aspirations if you are ruling a country from a humane and Christian perspective thinking on helping every single person? who, capitalist or socialist, needs to shut up somebody because he thinks differently if he is doing a good job as a president? ; all Chávez is doing by shutting down that channel is becoming the people he hates, the hater turns into the hated, left turns into right. Both of them, left and right, have committed and will keep committing free speech violations until there is a humane, social-oriented, Christian-based way of capitalism/socialism. Gaijin Da's Multiply Page: Some of the members of this band [ Nikkita, Roberto and Akito ] are my friends and they play anime music covers in anime conventions and stuff. If you want to listen to what they'll be playing next you must be a Multiply member though :P. Oh the name means "Foreigners" in Japanese. Wil Alfaro's Myspace Page: Wil is a friend I've known since highschool whom I appreciate a lot since he has influenced me so much in my musical taste and for that I am very thankful. He is a musician [ composer, producer, saxophonist, and a big ETC. ] and he has a recording studio and stuff, I don't think it has a name though haha but I remembered now I made a logo for it and I called it Studio SixtyWil XD. The stuff he has uploaded by now is very latin but he has also been producing a Salvadorian Death Metal band called Necrosadic, you can listen to a track he produced on their Myspace site. 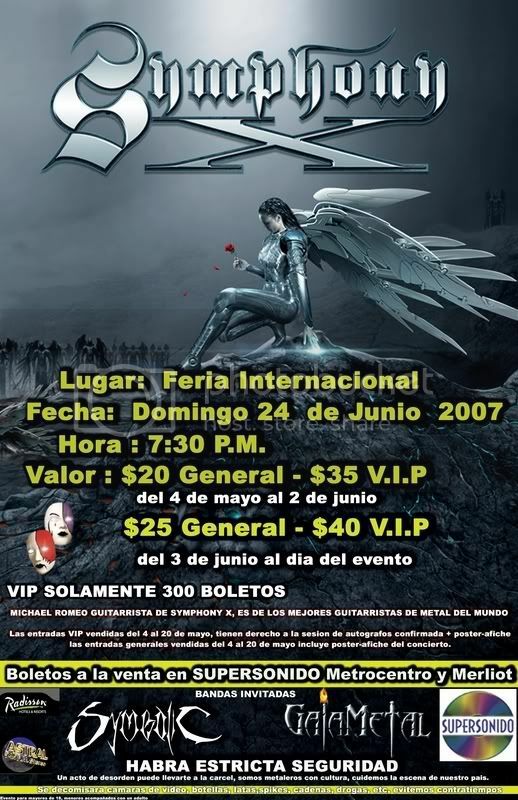 Oh well and since I'm talking about Salvadorian bands I must talk about one of the bands that will open the Symphony X concert in my country, Symbolic, they're quite alright, sort of Speed Metal/European Power Metal, check them out. Ah I forgot to mention that my computer "froze" and I lost some of the data I had downloaded already but I don't know if I should blame this on FoxTorrent, so I am not. Oh and I haven't installed openSUSE yet :P.
You've probably heard the term "idiot box" to refer to a television, today I'm bringing you another term: the idiot machine, I tried a lot to think of a short catchy name but believe me when I say that it was the best I could come up with; and the fact is that any other name I could think of expressed all the anger and indignation that cars make me feel towards them. I just can't believe how they have ruined our planet and it fills me with a lot of anger that maybe I should address to Eugenio Barsanti and Felice Matteucci or maybe to Karl Benz, I am not sure who to hate about all the destruction automobiles have made to the environment and even more to our society as we know it by making people want bigger cars and faster cars which pollute even more than some others. I don't know how can you dismiss ideas such as a steam powered car [ Ferdinand Verbiest ] or another one based on a hydrogen+oxygen mixture [ François Isaac de Rivaz ] and have the bright idea to use a non-renewable resource to power the transportation of billions of humans for the rest of the days -_-. I can't believe what a waste it has been and how people have never realized this up until now that it's too late and try to fix it with another ways like those hybrid stuff. It makes me so angry that humanity cares so little about itself. I will never buy a car, if I ever do, you have permission to ask me for the keys and it will be yours. I don't know why the idiot box is called that, I don't know if it is because you become an idiot by using it, or because it is an idiot invention itself or because the people who invented it were idiots; as for the cars, all of those reasons are true.